The man behind the Oslo and Utoya Island attacks says he rejects the court’s legitimacy and therefore can’t appeal. 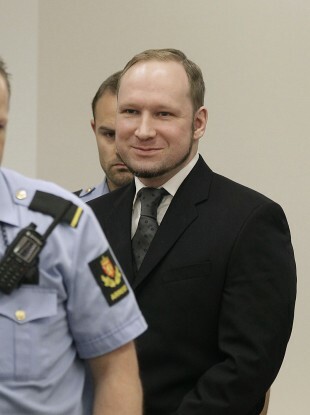 Anders Behring Breivik smiles as he arrives in the courtroom to hear its verdict earlier today. CONVICTED MASS-KILLER Anders Behring Breivik has indicated he will not appeal his 21-year jail sentence against his conviction. A court in Oslo this morning declared Breivik to have been sane when he carried out a massacre at a political youth camp, and an explosion in Oslo’s government district, in July 2011. This afternoon Breivik told the court he did not recognise its legitimacy, as it was an organ of a government which represented the cause of multicultural integration. Lodging an appeal against the court’s ruling, he said, would therefore be tantamount to acknowledging its legitimacy. This morning’s judgment is not expected to take legal effect for two weeks, however, as Breivik’s comments – saying he simultaneously rejected the court’s legitimacy, just as he indicated his intention not to appeal, painted a contradictory picture. Defence lawyers confirmed this evening that the trial judge had interpreted his comments to mean he had not yet accepted the judgment – meaning the option of an appeal is still open to Breivik should he wish to pursue it. The judgment will be formally certified once the two-week period for an appeal has lapsed. “He has stated very clearly, in very plain language, that he will not be appealing the judgment,” the lawyers affirmed this evening. The court had earlier ruled that Breivik’s habit of changing his story whenever prosecutors had noted inconsistencies or weaknesses had indicated that the 33-year-old was in full command of his faculties. The 21-year sentence is the maximum jail term that can be handed down by a Norwegian court, though the option remains for Breivik to remain in further incremental terms which could continue for the rest of his life. Had he been found insane, Breivik would instead have been detained in a psychiatric unit. He had indicated previously that he would appeal the court’s ruling – meaning an implicit admission of its legitimacy – if it had declared him insane. Email “Breivik says he won’t appeal 21-year jail term over killings”. Feedback on “Breivik says he won’t appeal 21-year jail term over killings”.